Charlotte Sting forward Charlotte Smith-Taylor has changed her jersey number in order to be constantly reminded of the approaching 2003 season. Having worn "23" because it was her mother's number in high school, Smith-Taylor now wears "0.""0"? "It represents my personal motto, "Take no prisoners,'" says Smith-Taylor, who has added the "Taylor" since getting married last fall. "I was also thinking, "Leave nothing on the court' and "Nothing less than the best.'" Those mottos easily apply to the Sting in general, especially veterans like Smith-Taylor. They remember all too well the Sting's swoon at the end of last season, which resulted in losing five of their last nine regular-season games and falling in the first round of the playoffs to the Washington Mystics. Winning the 2003 season opener against the same club, May 23 at the Charlotte Coliseum, would signal a fresh start. "This is the team (Washington) that ended it last season and the team that will start our new beginning," Smith-Taylor says. New beginning indeed. Returning its entire starting line-up and having strengthened its bench, the Sting should be a contender in the Eastern Conference, where they finished second to New York last year. If their young center Tammy Sutton-Brown continues to progress and receives more back-up support, and Sting veterans play well, the team should make the playoffs and perhaps win the conference outright. But it won't be easy. All WNBA teams are stronger this season since picking up players from the dissolved Miami and Portland teams. To shore up the center position, the Sting acquired (former Sting player) Pollyanna Johns Kimbrough from Miami. Having all their starters back is a big advantage for the Sting. But Sutton-Brown and small forward Allison Feaster have missed most of training camp while finishing play in Europe. They were due back in Charlotte several days before the Sting's opener May 23. How quickly they jell with their fellow starters will likely determine how well the Sting start the season. There are also other important chapters to be written in the Sting's new beginning, such as a new head coach and new owner. Trudi Lacey moved up from assistant coach when Anne Donovan left to become head coach of the Seattle Storm, and the Sting is now owned by Bob Johnson, who acquired the team when he won the rights to Charlotte's new NBA team. How the new coach and new owner will play out is naturally up in the air. Lacey, a star player at NC State in the late 70s and early 80s, was a winning coach at Frances Marion (53-12, two seasons) and a losing coach at the University of South Florida (86-131, eight seasons). Since that time, she's worked as a coach and selection committee member with USA Basketball, which picks Olympic and other international teams. She also has had two years of experience under Donovan, was part of the staff when the Sting made one of the greatest comebacks in pro sports history in 2001, and is liked and respected by the players. New owner Bob Johnson has been verbally supportive of the Sting, calling them his "first born" and assuring fans he'll raise the marketing level of the team -- which suffered under George Shinn and Ray Wooldridge, particularly in 2000 and 2001 as they fixed their eyes on moving the Hornets. Johnson, who mentioned his appreciation of the Sting high in his remarks the day he won rights to the men's team, could emerge as the patron saint the team has never had. But it remains to be seen. At a pre-season party for season ticketholders, when asked about the Sting's media coverage, he wasn't aware that the Charlotte Observer had reduced its coverage of the team over the last two years. He also didn't find a way to keep talented head coach Anne Donovan, who had led the team from a dismal 8-24 season in 2000 under coach T.R. 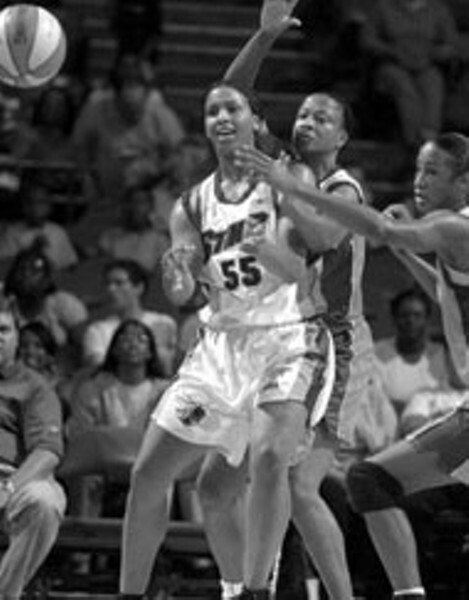 Dunn to the WNBA championship series in 2001. Donovan slipped through the cracks between the time the WNBA owned the Sting (after the Hornets left) and Johnson was named the new owner. Although technically Johnson was barred by league rules from contacting existing Sting employees before he became the new owner, had he been interested in ensuring Donovan was a centerpiece of his new Sting franchise, it could have happened. Instead, neither he nor the league intervened and Donovan accepted a three-year guaranteed contract with Seattle. Johnson also brings to Charlotte a reputation as a bottom-line businessman, based on how he operates the Black Entertainment Network, which he founded and still runs for owner Viacom. To meet financial goals in recent years, he gutted BET's news operation. Johnson will also have to dump plenty of dinero into marketing the men's team. It's no slam dunk; it's a three-pointer at minimum.